Announcing Corporate Partnerships, Participating Designers, Textile Houses and High-Street Brands! 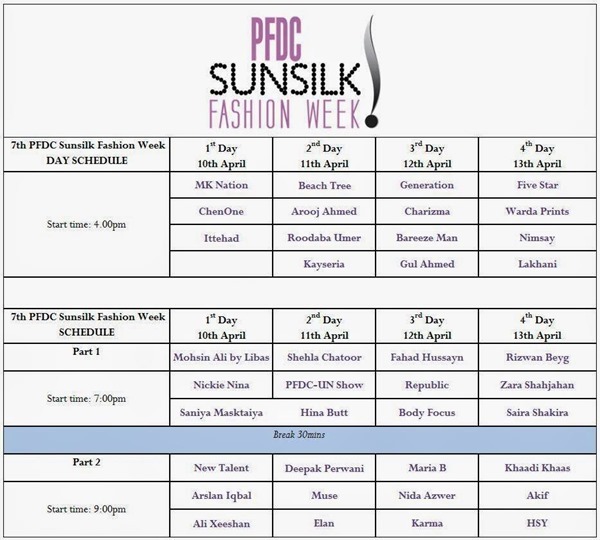 [Lahore: 10th April 2014] In the lead up to the 7th PFDC Sunsilk Fashion Week [#PSFW] being held from the 10 – 13th of April 2014, the Pakistan Fashion Design Council reveal their participating designers, textile houses and high-street brand list along with information on their corporate synergies. Indeed the 7th PFDC Sunsilk Fashion Week marks the tenth fashion week platform initiated by the Pakistan Fashion Design Council [with seven weeks of pret-a-porter and three of bridal fashion] and is a direct manifestation of the Council’s commitment to sustainability, structure and discipline with the business of fashion and the facilitation of Pakistan’s retail industry. To this end, as announced earlier this February 2014, with their 7th consecutive prêt-a-porter Fashion Week, the PFDC Sunsilk Fashion Week 2014 teams continue and further their commitment to 3 distinct platforms within PSFW with separate showcases by Luxury/Prèt designers, High-Street brands and Textile Houses over a period of 4 days, defining and presenting trends for 2014, focusing specifically on the regions’ long hot summer months. Also in continuation of their spirit of promoting brand accessibility, the PFDC have invited all participating brands and designers at PSFW to create a dedicated stall space at the PFDC’s popular state of the art exhibition area, within the main runway show venue. For More Update News and daily Gossips about PFDC Sunsilk Fashion Week 2014 visit following links.